The decision 170 years ago to build a great viaduct across the Neisse Valley was a visionary leap. Now that elegant structure needs a dose of 21st-century vision. Because what use is a graceful viaduct if it doesn't have any trains? The railway viaduct which crosses the River Neisse between Görlitz and Zgorzelec is a structure of rare beauty. Though there were surely local voices protesting against its construction across the green valley of the River Neisse in 1847. But just as viaducts elsewhere have settled into the landscape, so too has the long railway viaduct across the Neisse. History has not always been kind to this structure. During the Second World War, many trains running east over the viaduct were bound for the concentration camp at Auschwitz. For thousands of Jews being transported to their deaths, that journey over the Neisse, with its glorious views of valley and woodland, was perhaps an all-too-brief reminder of gentler, safer times before the war. In the very final hours of the war, after the unconditional capitulation of Germany had already been agreed, Wehrmacht troops detonated the central spans of the viaduct. Only twelve years later was the rail route over the Neisse viaduct reopened and by then the five-minute journey from Zgorzelec to Görlitz had become an international adventure. For the post-war Potsdam Agreement defined Germany's new eastern frontier along the Oder and Neisse rivers. Under the new order, Görlitz was now the easternmost town in the German Democratic Republic and the territory east of the Neisse belonged to Poland. Although the two countries on either side of the border were both partners in the Warsaw Pact, the fraternal bonds of socialist solidarity found little expression in the day-to-day affairs of the Neisse Valley. Not a lot of passenger trains rolled over the viaduct. But slowly the traffic built up, and by 1965 there was even a train carrying through carriages from Paris which trundled over the Neisse viaduct on its journey to Kraków. Whether there was brisk business on the Paris to Kraków run 50 years ago we do not know. The journey took 35 hours, and required two nights on board in ordinary seating. There were no couchettes or sleepers running through from Paris to Kraków, so this was surely a trip only for very hardy comrades. The political and social eruptions of 1989 ushered in a new era of importance for the old viaduct. Suddenly all Europe was on the move. Those who watched the movement of trains across the Neisse Valley could occasionally spot Russian carriages slipping over the border from Poland to Germany. Even the Moscow to Geneva service came this way. This looked like a railway whose hour had eventually come. The two German states were united 25 years ago next month. Poland joined the European Union and was later admitted to Schengen. Borders faded all over Europe. With no frontier formalities, Görlitz and Zgorzelec moved closer. In 2012 and 2013 there was a major programme of renovation, funded in part by the European Union, to create a viaduct fit for a new Europe. That new Europe was still on the move, but the new Europeans had discovered discount airlines and coach services with bargain basement fares. Throughout last year, there were six daily trains crossing the viaduct - three in each direction. 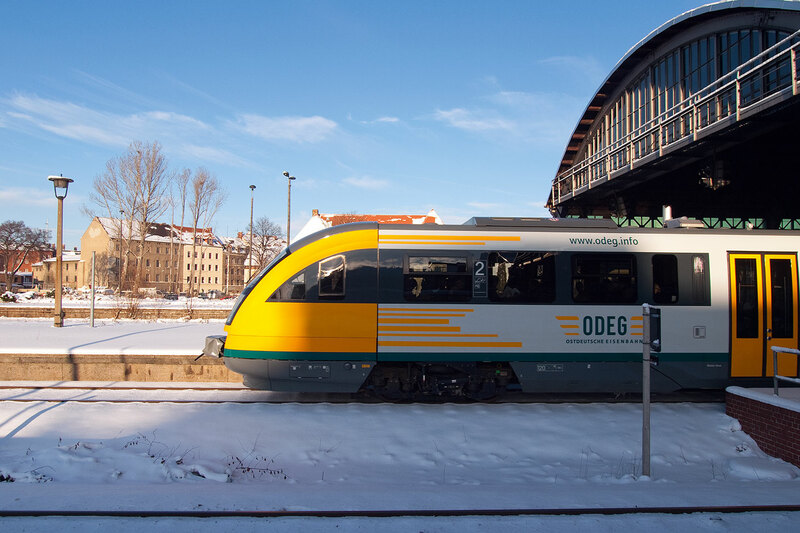 When we used one of those trains in the depths of last winter, a service from Wroclaw to Dresden, it was well filled for the journey west as far as Zgorzelec. There the Polish crowds decanted, and the train was eerily empty as it slipped over the Neisse viaduct into Germany. In Görlitz, it filled up again, with students and workers travelling home to the various communities in Saxony where the train stopped on the run west to Dresden. This tale of empty trains across frontiers is replicated elsewhere in central Europe. So it was no surprise when all passenger trains over the Neisse viaduct were axed earlier this year. "There's no market," explained officials. The market is a tough thing, is it not? We suspect that half a century ago, no-one ever hired consultants to evaluate the potential market for rail travel between Paris and Kraków. The ruling piety today defers to the market and probably doesn't see the Neisse viaduct as an asset. 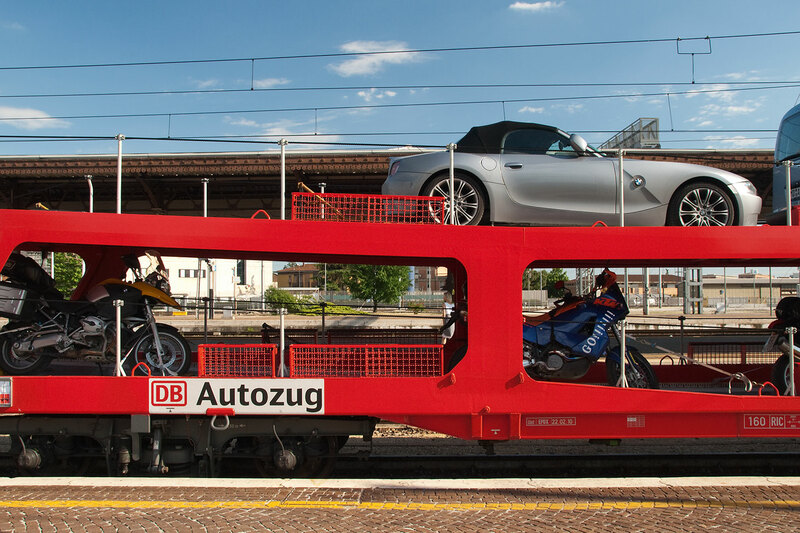 Rumours that a cross-border rail service might be reinstated this week are just rumours. There will not be any trains from Görlitz across the Neisse viaduct this month... or next. But there are very tentative plans to reinstate a train service in mid-December this year. We'll be the first to cheer if it happens. If a new service is to have any chance of survival, it needs to be accompanied by decisive action to stimulate the market for cross-border rail travel. That would be the visionary thing to do. The decision 170 years ago to build a great viaduct across the Neisse Valley was a visionary leap. Now that elegant structure, one of central Europe's finest pieces of railway engineering, needs a dose of 21st-century vision. Because what use is a graceful viaduct if it doesn't have any trains?